The author was UNFPA Representative for Sri Lanka & Country Director for the Maldives. 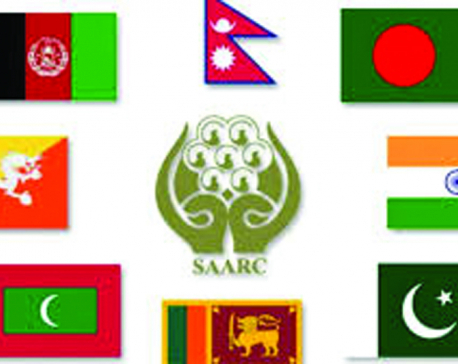 The 33 years old South Asian Association for Regional Cooperation (SAARC) should have been fully mature and delivering development to poverty-stricken and needy millions in its eight member nations—Afghanistan, Bhutan, Bangladesh, India, the Maldives, Nepal, Pakistan and Sri Lanka—which make a home to an almost a quarter of the global population. But SAARC has moved at a snail’s pace for about fifty percent of its existence and been in slumber in the remaining half of its life. One clear sign of its limited productivity and usefulness so far is reflected in its missed 15 Summits, the last being 18th in Kathmandu in November, 2014. The 19th SAARC Summit was scheduled to be held in Pakistani’s Islamabad on 9 and 10 November, 2016. India then announced boycott of the Summit alleging Pakistan’s role in a terrorist attack on the Indian Army camp in Uri of Jammu and Kashmir in September 2016. Bangladesh, Bhutan, the Maldives, Sri Lanka and Afghanistan also declined to attend the summit following India’s lead. Nepal, as the Chair of SAARC, has been urging all member states to create a favorable environment for 19th Summit within the spirit of the SAARC charter. 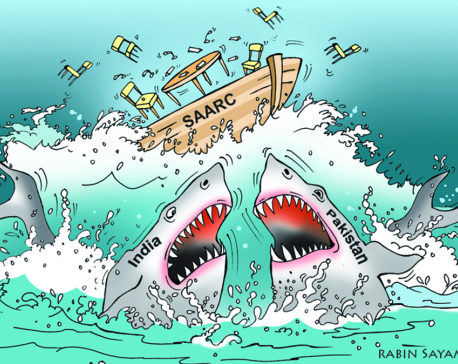 Two relevant questions at the moment are: Why did SAARC flounder in the past? Can it be invigorated for better future? Political leaders and experts have three broad views about past performance of SAARC and its future prospects. 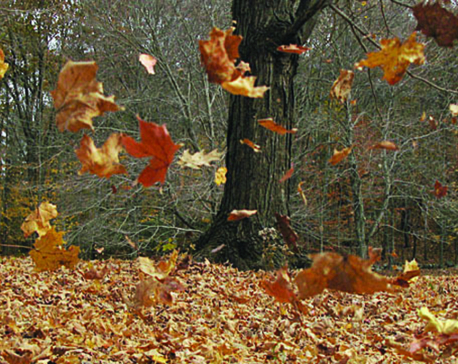 First is the optimistic view which argues that it is moving though slowly. It needs push from all fronts and will ultimately deliver wellbeing to the region. Second view expresses alarmed and pronounces that it has slipped into a “coma”. Thus, it needs immediate shock treatment if it is to be revived to enable to meet its goals. The third and the most pessimistic ones have written it off as almost “dead” institution, with little chance of revitalization. More or less there is a consensus on why it has failed to function properly so far and what lies at the heart of its future resurrection. Obviously, all the member states are responsible for the past predicament and for its brighter future. But the bulk of the responsibility for its past failure and future revitalization lies on two of its weighty members—India and Pakistan. While some meetings, seminar and actions are continuing at different levels after Kathmandu Summit, essential progress can take place only if India and Pakistan sort out their differences. The latest statements and trust deficit emanating from New Delhi and Islamabad do not give much hope and SAARC appears to sink further at least in the short run. Vikas Swarup, spokesperson of the Ministry of External Affairs of India, recently tweeted: “Regional cooperation and extremism will not go side by side. Therefore, India will not take part in the upcoming Islamabad summit.” “We have already informed Nepal, incumbent Chairman of the SAARC Summit, about it,” he mentioned. “Unless and until Pakistan stops terrorist activities in India there will be no dialogue and we will not participate in SAARC,” said Indian Foreign Minister Sushma Swaraj in a press conference in Hyderabad, on November 28, 2018. Clearly, these statements were in response to what the Pakistan Foreign Office Spokesman Mohammad Faisal had said a day or two earlier that the Indian PM will be invited to Pakistan for the SAARC Summit. During the ensuing period an interesting piece of Indo-Pak politico-diplomatic puzzle also fell in sight. Pakistan took initiative to link two holy sites of Sikhs—birth place and Samdhi of Guru Nanak—that have fallen in India and Pakistan since its partition in 1947 and made efforts to connect them by open road for Indian Sikhs to pay homage to their most revered first saint—the initiative that had failed to take concrete shape since the early 1980s. The ground breaking ceremony was performed by Pakistani Prime Minister Imran Khan in November 2018 to construct a four-kilometer long corridor from Dera Baba Nanak, Gurudashpur in India to Kartarpur Sahib, in Pakistan on Guru Nanak’s 550th birth anniversary in November 2019. This was taken by a good number of experts and politicians as a strong gesture towards improving relations with India, including finding support to hold 19th SAARC Summit in Islamabad. Nonetheless, only days after the foundation stone of Kartarpur corridor was laid by PM Khan, Foreign Minister Shah Mehmood Qureshi and his Indian counterpart Sushma Swaraj undertook a ‘war of tweets’, blaming each other for using the occasion for political gains. Indo-Pak relations are unlikely to take clearer and better shape until the 2019 Indian Parliamentary elections are over. Also, power dynamics among key Pakistani players—political parties, military and intelligence—are yet to fully stabilize following Khan’s victory for clearly friendly rapprochement towards India. A well established and politically powerful former PM Nawaj Shariff has recently been jailed on corruption charges. Impending actions against Pakistan People’s Party stalwarts and father son duo—Asif Ali Zardari and Bilawal Bhutto Zardari—are looming large in the horizon. On the other hand, India has been trying hard to promote BIMSTEC in place of SAARC given the perpetual Indo-Pak standoff and their preferred geo-politics. BIMATEC was founded in 1997 for enhancing economy, connectivity and multi-sectoral cooperation for advancing wellbeing of people of the region. During its fourth Summit themed “Toward Peaceful, Prosperous and Sustainable Bay of Bengal Region” that concluded with the Kathmandu Declaration on 31 August 2018, Indian Prime Minister Narendra Modi said: “All the countries in the BIMSTEC region have been affected by terrorism and drug-trafficking”. Accomplishing a common goal of economic prosperity and development is not possible without establishing peace and security and “India is ready to extend cooperation and collaborate with you all to this effect in the coming days”, Modi stressed. A better Indo-Pak relation is central to SAARC’s better performance and future. A long and almost intractable Jammu and Kashmir issue and their geopolitics confounded by USA, China and Afghanistan makes it difficult for any political leader of the countries to smoothen their relationship. While a strong voice in SAARC as a whole wishes for revival and effectiveness of the Association its prospects have shrunk further with India thinking seriously of its alternative, including BIMSTEC, and continuing allegation of India for state-sponsored terrorism from Pakistan. The change in Pakistani leadership under Imran Khan had raised some hope. But power dynamics between key players—politicians, military and intelligence—have stalled the efforts of the new leader to be able to shape stable and clear Indo-Pak relations. The end result? 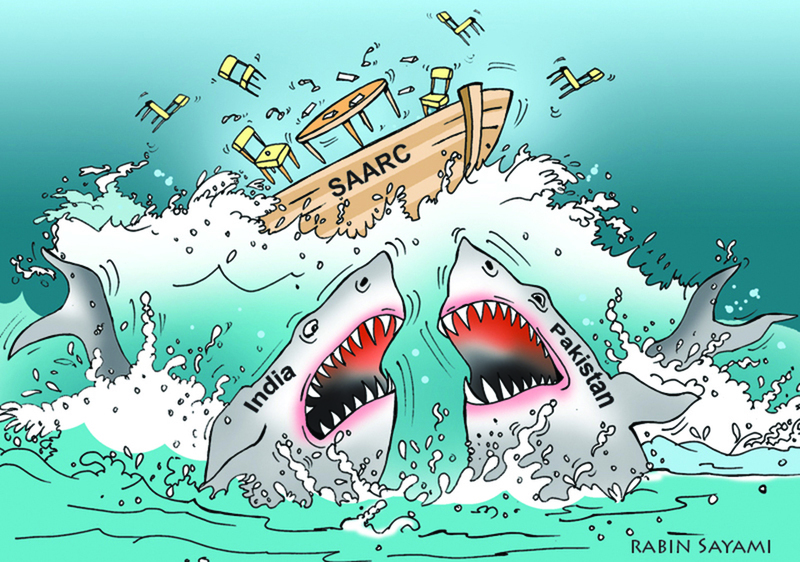 SAARC is likely to sink further, at least in the shorter run.